It is a stunning piece of craftsmanship, with a lion’s head pommel and a prominent “GR” crest near the quillon finial. The lion’s mouth yawns open to support the guard and a ring for a sword knot. The library record, likely culled from Norcross’s observations and that of subsequent curators, reads: “The blade has marks on underside of guard at tang: blued, etched and gilt designs incorporating GR cipher on one side and Order of the Garter/King’s Arms on the other. The scabbard is wood-lined sharkskin covered with gilded silver mountings, extravagantly engraved and stamped by the maker.” The sword and scabbard still gleam with finely etched, well-preserved lines of artistry. 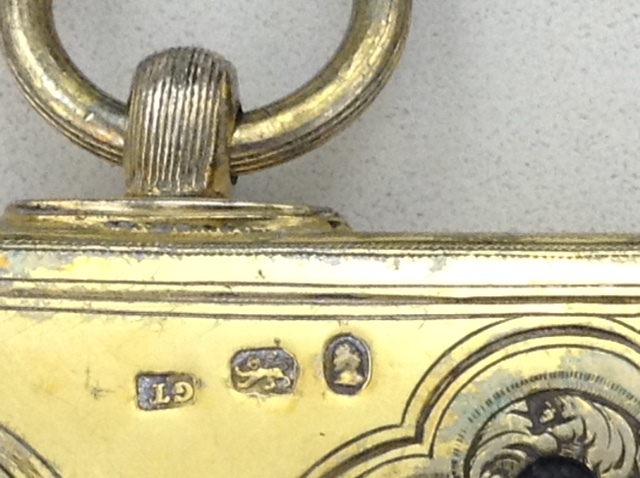 See the pictures here and below, for close-up images of the maker’s marks and other details. Whether the king had three faces or more, this (Georgian?) artifact reminds us that American perceptions of George III and his era need more attention. Now, with the digitization and interpretation of George III’s archive, scholars will have a chance to line up artifacts like these with the king’s words. (Good Junto readers: Omohundro’s George III Archives fellowship applications are due 8 May, act now!) And we’re curious to know more about this sword—the king’s arms?—so we invite your thoughts in the comments. With a research salute to our colleagues at The Royal Armouries…and stay tuned!